Since the industrial revolution, when people started to benefit from the convenience of machinery, our Carbon Dioxide output has become staggering. Everyone in the world now learns from an early age that we have been slowly destroying our planet. And yes, there has been some notable decline in our emissions, but will it be enough? Did you know that the Arctic plays a vital role in controlling the amount of heat that our planet absorbs? Ice and snow are responsible for reflecting the sun’s rays back to outer space, which means that a lot less heat is absorbed into the Earth. So, what happens when the Arctic ice and snow melts more than it should? The answer isn’t good. Without the help of ice and snow reflecting the rays to outer space, the enormous bodies of water and rocks, end up absorbing the heat. This, in turn, causes the ice to melt faster. This is what is known as the albedo effect. As you probably know, each time an iceberg melts, it raises the global sea level. If the sea level continues to grow steadily, it is possible that some time in the future coastal towns and cities could be submerged. The Arctic is warming faster than anywhere else in the world, and the climate changes that it experiences will have a ripple effect that we see this summer. Endless heatwaves in the Northern Hemisphere are caused by the warming Arctic. Arctic flora and fauna species are likely to either die out, or adapt to the new changes, and either outcome will have a huge impact on the rest of the world. Alaska is just one example of the effect that the Arctic has on the world. Sea ice melts at an average rate each year, but the sea ice along the Alaskan coast has been melting at an increased rate. During the 2016/2017 year, the sea ice was record low, due to the abnormally warm sea temperatures around Alaska. 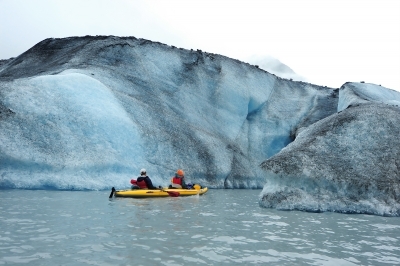 With the way things are progressing, you may want explore Alaska before there are no more beautiful glaciers left to see. To further aggravate the issue, since the industrial revolution, the acidic levels in the world’s oceans have risen to 30%. As it stands now, the colder oceans are acidifying twice as fast. Elevated levels of acidic water affect many life forms in the ocean, from coral reefs and shell fish, to the tiniest plankton. There are some small cities and towns which rely almost entirely on fishing as a source of income. What happens to these places when their main livelihood is dying or inedible due to the high percentage of acid? And what would happen if the acidic levels increased to the point where it would be harmful to humans as well? While many believe that we should be doing everything that we can to slow down the seemingly inevitable climate change, there are some who think that we should allow nature to take its course. Indeed, it may seem like a futile effort to try and steer the course of nature into a different direction. Whichever side you choose in this debate, I think we can all agree that this is a global problem, and we cannot ignore it in the hopes that it will just disappear. It has been hypothesised that one stretch of ice will remain when all others are gone. This ‘Last Ice Area’ has become the focus of the World Wide Fund for Nature’s (WWF) goals. The RACER project has been created to identify and map any ice regions that could possibly be more resilient to climate change. The project is also responsible for assisting in the strategies needed for species, ecosystems and cultures to adapt and cope with the climate change in the Arctic. The efforts being made to slow down climate change are admirable – but are they enough? The ice is still melting at an alarming rate, and entire ecosystems are changing. There may come a point when there is nothing left to do except evolve to survive our changing world.